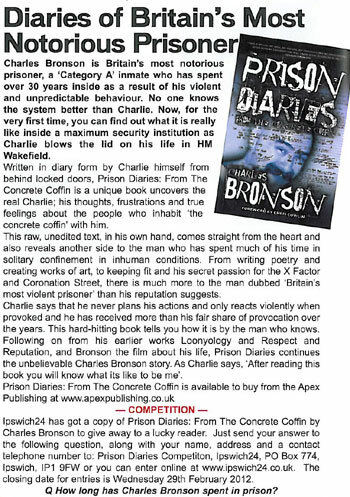 Brief Description: Charles Bronson is Britain’s most notorious prisoner, a ‘Category A’ inmate who has spent over 30 years inside as a result of his violent and unpredictable behaviour. No one knows the system better than Charlie. Now, for the very first time, you can find out what it is really like inside a maximum security institution as Charlie blows the lid on his life in HM Wakefield. 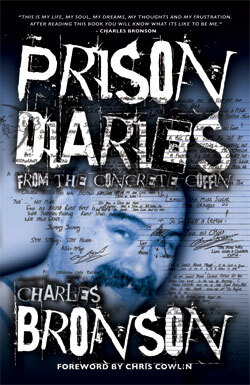 Written in diary form by Charlie himself from behind locked doors, this unique book uncovers the real Charlie; his thoughts, frustrations and true feelings about the people who inhabit ‘the concrete coffin’ with him. This raw, unedited text, in his own hand, comes straight from the heart and also reveals another side to the man who has spent much of his time in solitary confinement in inhuman conditions. From writing poetry and creating works of art, to keeping fit and his secret passion for the X Factor and Coronation Street, there is much more to the man dubbed ‘Britain’s most violent prisoner’ than his reputation suggests. Charlie says that he never plans his actions and only reacts violently when provoked and he has received more than his fair share of provocation over the years. This hard hitting book tells you how it is by the man who knows. Following on from his earlier works Loonyology and Respect and Reputation, and Bronson the film about his life, Prison Diaries continues the unbelievable Charles Bronson story. As Charlie says, ‘After reading this book you will know what its like to be me’. About the Author: Charles Bronson (born 6 December 1952) is the adopted name of Michael Peterson, a British criminal. Bronson was born in Aberystwyth, before moving to Merseyside, and later Luton, which is often referred to as his home town. Bronson states on his website that contrary to reports frequently made in the press, his name was changed by his fight promoter in 1987 and was not a choice he made in relation to the actor, Charles Bronson. Bronson has been in prison since the age of nineteen, for various offences. Initially jailed in 1974 for robbery, his sentence has been repeatedly extended and he has spent only three months out of custody. He has served 30 years of his time in prison in solitary confinement due to repeated attacks on prison staff and inmates, including a number of hostage situations and rooftop protests. His dangerous behaviour has meant that he has spent time in over 120 different prisons. In 2000 he received a discretionary life sentence (with a three year tariff) for a hostage-taking incident. His appeal against this sentence was denied in 2004. In 1999 a special prison unit was set up for Bronson and two other violent prisoners from Woodhill (HM Prison), to reduce the risk they posed to staff and other prisoners. In 2001 Bronson married Saira Rehman, who had seen his picture in a newspaper and began writing to him. Rehman had visited Bronson just three times prior to their wedding. Bronson converted to Islam (Rehman is a Muslim) and was also known as Charles Ali Ahmed. However he and Rehman have since divorced and Bronson has reportedly renounced Islam and the Ali Ahmed name. While in prison he has developed an extreme fitness regimen and regularly performs 2,500 press-ups a day. In 2002 he published a book Solitary Fitness, detailing an individual training process with minimal resources and space. For the past ten years Bronson has occupied himself by writing poetry, producing pieces of art and has published ten books. Chaz, as he is known to his many friends and supporters, is still a "Category A" prisoner and is currently being held at HM Wakfield prison. What can you say about the irrepressible Charles Bronson that has not already been said? Beaten, constantly transferred from jail to jail, pepper-sprayed, drugged, nutted-off and locked in an isolation cell on the same unit as cannibals and mass murderers, and that only tells a small portion of his story. The fact that the man is still compos mentis enough to write another hugely entertaining book from inside a double-doored cage deep in the bowels of HMP Wakefield’s CSC unit is surely a testament to his status as a true survivor. There cannot be many people left in this country who are not aware of the actions and antics of the man whom the tabloid press have dubbed ‘Britain’s Most Dangerous Prisoner’ over the years. 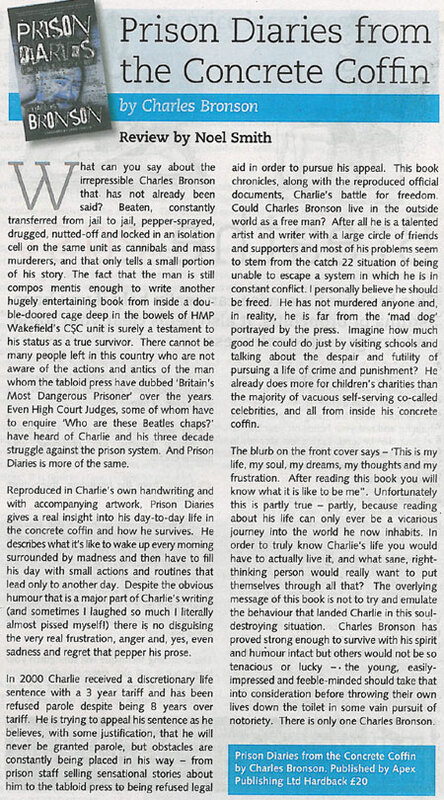 Even High Court Judges, some of whom have to enquire ‘Who are these Beatles chaps?’ have heard of Charlie and his three decade struggle against the prison system. And Prison Diaries is more of the same. 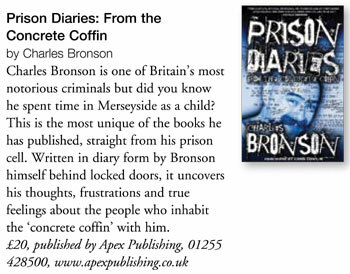 Reproduced in Charlie’s own handwriting and with accompanying artwork Prison Diaries gives a real insight into his day-to-day life in the concrete coffin and how he survives. He describes what it’s like to wake up every morning surrounded by madness and then have to fill his day with small actions and routines that lead only to another day. Despite the obvious humour that is a major part of Charlie’s writing (and sometimes I laughed so much I literally almost pissed myself!) there is no disguising the very real frustration, anger and, yes, even sadness and regret that pepper his prose. In 2000 Charlie received a discretionary life sentence with a 3 year tariff and has been refused parole despite being 8 years over tariff. He is trying to appeal his sentence as he believes, with some justification, that he will never be granted parole, but obstacles are constantly being placed in his way – from prison staff selling sensational stories about him to the tabloid press to being refused legal aid in order to pursue his appeal. This book chronicles, along with the reproduced official documents, Charlie’s battle for freedom. Could Charles Bronson live in the outside world as a free man? After all he is a talented artist and writer with a large circle of friends and supporters and most of his problems seem to stem from the catch 22 situation of being unable to escape a system in which he is in constant conflict. I personally believe he should be freed. He has not murdered anyone and, in reality, he is far from the ‘mad dog’ portrayed by the press. Imagine how much good he could do just by visiting schools and talking about the despair and futility of pursuing a life of crime and punishment? He already does more for children’s charities than the majority of vacuous self-serving co-called celebrities, and all from inside his concrete coffin. The blurb on the front cover says – ‘This is my life, my soul, my dreams, my thoughts and my frustration. After reading this book you will know what it is like to be me”. Unfortunately this is partly true – partly, because reading about his life can only ever be a vicarious journey into the world he now inhabits. In order to truly know Charlie’s life you would have to actually live it, and what sane, right-thinking person would really want to put themselves through all that? The overlying message of this book is not to try and emulate the behaviour that landed Charlie in this soul-destroying situation. Charles Bronson has proved strong enough to survive with his spirit and humour intact but others would not be so tenacious or lucky – the young, easily-impressed and feeble-minded should take that into consideration before throwing their own lives down the toilet in some vain pursuit of notoriety. There is only one Charles Bronson. A fascinating insight into one of Britain's most notorious criminals. An honest, astounding and witty take on prison life from someone who's spent most of his life there. If you think prison is like a holiday camp, then this book will change your mind. 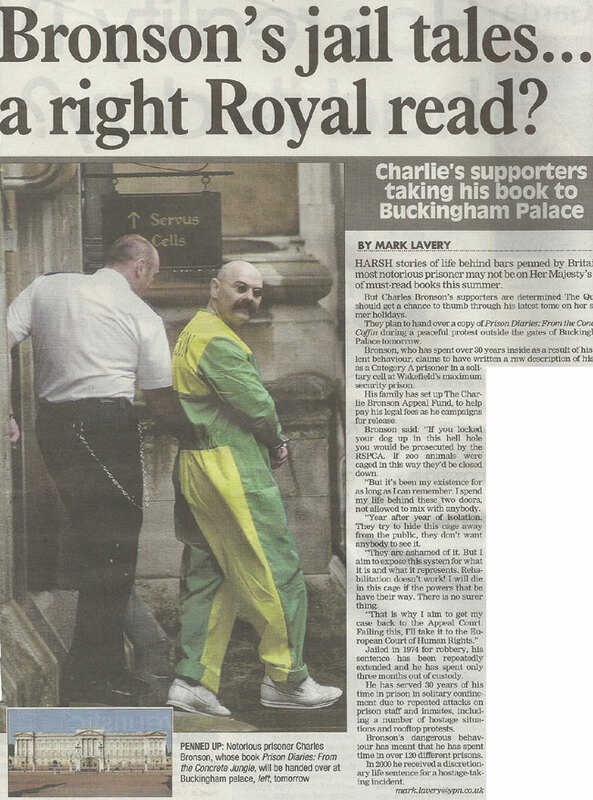 BRONSON'S JAIL TALES ... A RIGHT ROYAL READ? 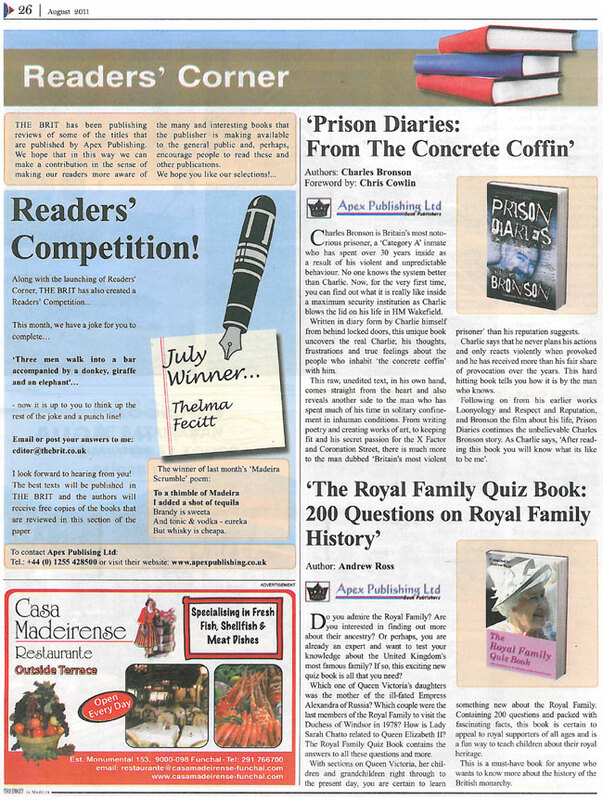 HARSH stories of life behind bars penned by Britain’s most notorious prisoner may not be on Her Majesty’s list of must-read books this summer. But Charles Bronson’s supporters are determined The Queen should get a chance to thumb through his latest tome on her summer holidays. They plan to hand over a copy of Prison Diaries: From the Concrete Coffin during a peaceful protest outside the gates of Buckingham Palace tomorrow. Bronson, who has spent over 30 years inside as a result of his violent behaviour, claims to have written a raw description of his life as a Category A prisoner in a solitary cell at Wakefield’s maximum security prison. His family has set up The Charlie Bronson Appeal Fund, to help pay his legal fees as he campaigns for release. 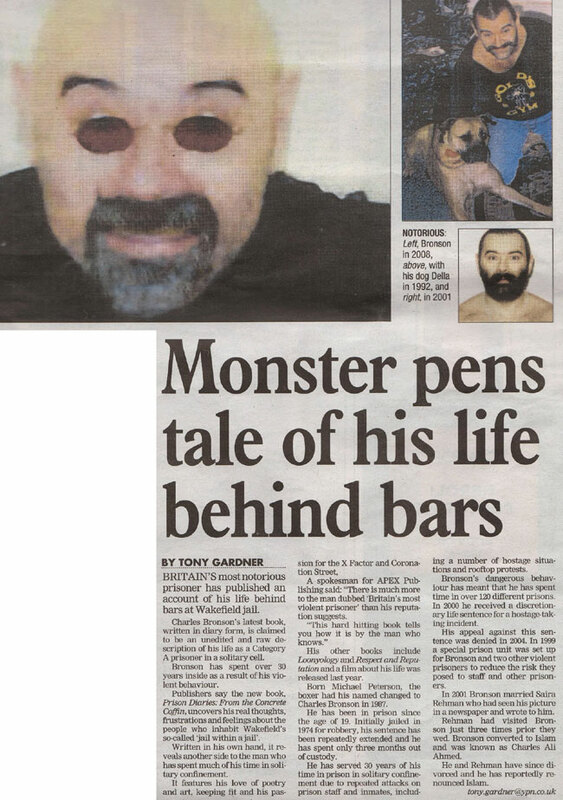 Bronson said: “If you locked your dog up in this hell hole you would be prosecuted by the RSPCA. If zoo animals were caged in this way they’d be closed down. “But it’s been my existence for as long as I can remember. I spend my life behind these two doors, not allowed to mix with anybody. “Year after year of isolation. They try to hide this cage away from the public, they don’t want anybody to see it. “They are ashamed of it. But I aim to expose this system for what it is and what it represents. Rehabilitation doesn’t work! I will die in this cage if the powers that be have their way. There is no surer thing. Jailed in 1974 for robbery, his sentence has been repeatedly extended and he has spent only three months out of custody. He has served 30 years of his time in prison in solitary confinement due to repeated attacks on prison staff and inmates, including a number of hostage situations and rooftop protests. 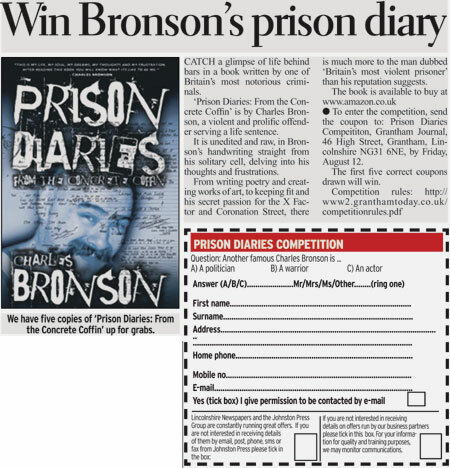 Bronson’s dangerous behaviour has meant that he has spent time in over 120 different prisons. In 2000 he received a discretionary life sentence for a hostage-taking incident.